Audi unveiled its 2013 RS4 Avant this week in Geneva. But just like most other RS models, this one too, will not be coming to the US. Though, Audi fans worldwide will have something to cheer for since they have their favorite car to challenge Mercedes AMG and BMW M. The 2013 RS4 Avant seems to be Audi’s entrant in the high-end performance car segment, which in the past 5 years or so has seen tremendous growth and improvement, both in terms of technological achievement and rising sales. Mercedes and BMW have captured this market well and it is now very hard for anyone to grab a chunk of this market. 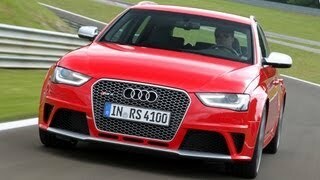 But with the launch of the 2013 RS4 Avant, Audi may well give them a good competition. 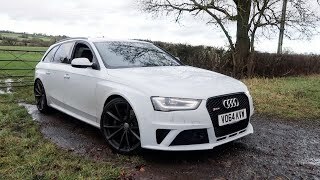 So let’s take a look what the RS4 Avant is all about. Under the hood, the RS4 Avant is powered by 4.2L V8 capable of giving a max power of 450 HP @8250rpm and a peak torque of 317 lb-ft. Mated to a 7-speed transmission, the engine provides power to all the four-wheels of the car. With all this power under its belly, the RS4 Avant can gallop from 0-60mph in under 5 seconds and can achieve a top speed of 155mph. On the outside, the new generation RS4 can easily be identified because of its single frame hexagonal grille with a matte aluminum finish and high-gloss anthracite honeycomb insert. The exterior mirrors have also been given the same matte aluminum finish. Clasp like Xenon plus LED lights encircle the front ends of the car. The overall sporty appearance of the2013 RS4 Avant might just make you remember the 1980 Quattro. 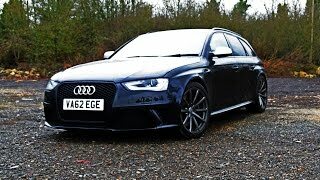 The aggressive exterior of the 2013 RS4 Avant is contrasted perfectly by the elegant interior of the car. The interior of this car is all black and comes with a silvery roofliner and different chrome elements. Customers will get to choose from various interior color options, such as, Aluminum Race, Brushed Matte Aluminum, Black Piano Finish, or a light stainless steel mesh. The front seats will be made of black leather and Alcantara, but Nappa leather seats will also be made optional for those who are always ready to spend the extra bucks. As has been mentioned earlier, the 2013 RS4 Avant might not be making it to the US. But it will be launched in Europe in fall this year. The base price of this vehicle will be 76,600 Euros ($100,100 at current exchange rate) and will go up according to customization.